Eli Freedman and Kirk Berlenbach. Photo by Danya Henninger. When a group of young adults from Congregation Rodeph Shalom gathered at Rabbi Eli Freedman’s home for a “sha-barbecue” one summer evening, he did not say kiddush over wine. Instead, he recited the traditional Sabbath blessing over beer. No one was shocked. In fact, the swap made total sense, since many of those at the Friday night dinner were also members of the Philadelphia synagogue’s homebrew club. When Freedman started the club, it wasn’t just an excuse to hone his homebrewing skills with other Jewish beer geeks, although the camaraderie was welcome. It was also part of a conscious effort to get the younger people in his flock involved in the temple. As someone in his early 30s himself, he recognized that people his age were more likely to participate in religious activities if there was beer involved. That was back in 2011, and though he didn’t know it, Freedman was at the forefront of a growing trend. Beer as a device to attract new members and invigorate dwindling parishes has been gaining in popularity throughout the country. 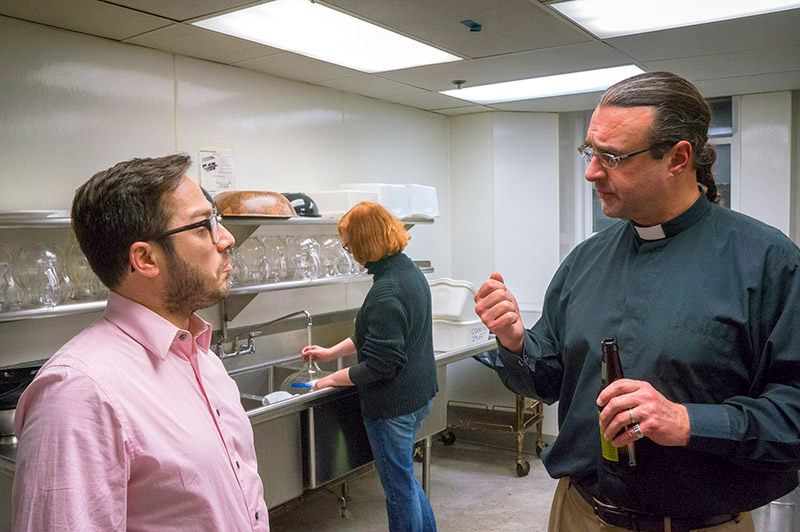 A Boston group called The Pub Church holds weekly services at a dive bar. “What Would Jesus Brew” is the homebrew club of a Michigan parish. San Diego is home to the now-commercial beer label Hess Brewing, which started life as a Bible study project. Why are religious leaders turning to beer? Because churches are losing young people, fast. The share of Americans who consider themselves unaffiliated with any organized religion grew to 20 percent from 15 percent over just five years, according to a 2012 report by the Pew Research Center. The bias is more pronounced in people under the age of 30, where 32 percent do not affiliate themselves with any formal sect. Beer, on the other hand, continues to be Americans’ favorite drink and savvy religious leaders are taking advantage of beer’s increasingly hip reputation and connecting the two. One of the largest brew-ligious movements goes under the banner “Pub Theology,” a name taken from the title of a popular 2012 book by pastor, Bryan Berghoef. The informal organization, which follows the mantra “beer, conversation and God,” has spawned regular meetings of more than 140 groups in 41 states. While many believe the church frowns on drinking, Kirk Berlenbach, a Episcopal priest who started a homebrew club at his Roxborough, PA, church nearly a decade ago says that of all the references in the New Testament to alcohol, around a third were found to be negative but that negativity wasn’t toward beer or wine itself, but toward getting overly drunk. If you go beyond the pub, as the church and synagogue homebrew clubs do, there’s even more benefit to choosing beer. Compared with wine, it’s relatively easy to make, so even novices can take part in the process. Plus, when you’re brewing, there’s a short period of downtime, setting up a perfect discussion period. “Once you get the wort bubbling and you’re sure the heat is right, there’s a good 45 minutes with nothing to do,” Freedman says. He uses that time to introduce questions to his group to spark a dialogue—usually over beers members have brought with them. Together, Berlenbach, Freedman and Berghoef have experienced the powerful draw of beer firsthand. Over the last few years, the trio have teamed up to give talks at both Philly and DC Beer Week. The events have been successful with overflowing crowds eager to hear a priest, a minister and a rabbi speak. Sometime around the year 400, a rabbi wrote, “Don’t drink beer brewed by non-Jews.” The reason for this interdiction turns out to be because beer can make those who brew and drink it together too friendly—it was a decree to avoid intermingling (and ostensibly, intermarriage) with those of other faiths. But today, that mingling is more than welcome. In fact, Freedman and Berlenbach have done more than share a pint and speak. They’ve brought their homebrew clubs together for brew sessions, both at the church and at the synagogue. Interfaith Brewing, as they’ve dubbed their collaboration, even produced a bottled beer that was served at last year’s 2013 Purim celebration at Rodeph Shalom. The beer’s name? Ecclesiastes 3:1—To Everything There’s a Saison. And it was good. We are part of the bigger God/faith/beer/conversation as well over here in Santa Paula, CA. (Ventura County) – http://www.garmanspub.com – Garman’s Pub on Facebook – honored to be part of the larger gathering the last 6 years.